I first saw Jeanne Johngren’s work at a tiny, 19th Street shop in the Chelsea district of NYC called DVVS. One of the store owners, James Corry, showed me around, pointing out some of his favorite artists. When we came to the Jeanne Johngren display, he mentioned that one of his clients wanted to “just live in that case”. I knew what he meant. 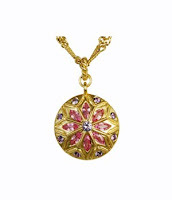 The rich bead colors, gorgeous metals and fine workmanship combine to make sumptuous, beautiful pieces. In reading more about Jeanne, I was surprised to learn that her path mirrored my own…a first career in the TV/film business with a switch along the way to jewelry design and creation. Although Jeanne is now very well-established and I am just starting out, her ability to successfully make that transition gave me renewed optimism! 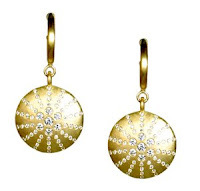 Before becoming a jewelry designer I was a film and TV producer, based in NYC at the Tribeca Film Center. I made the decision to change careers because I wanted to have a family. Life in the film industry is about long hours where the myriad problems at hand overshadow outside life. I had many friends in the film business, few of whom stayed married. No matter what their occupation — sound man, cinematographer, or actor, the long, intense hours meant that it was very hard to build meaning outside of that context. When I met the man whom I decided to marry, I went looking for my next career. I had certain criteria I had to meet — I needed something creative, where I could make an aesthetic statement and I needed flexibility. How would you compare the making of a video or film to the creation of jewelry? I think that there are a lot of similarities between making jewelry and making a film. A)- you are realizing an idea, you are involved in an act of creation. B)- you are working with a team of true artisans. In the film world it is cinematographers, sound designers, editors and art directors. In the jewelry world, it is CAD/CAM design people, gemstone dealers, gemstone setters, casters, finishers and polishers. In both worlds, you have to motivate the individuals involved to give the work their best effort. D)- selling plays an important role. In the film industry people are always moving toward their next project. If you are the producer, you have to sell your ideas all the time — to the cast, crew and financiers. In the jewelry industry, you have to sell to individuals at trunk shows and to stores at trade shows (or on appointments.) You can’t be afraid of selling in either field. How did you first get into jewelry making and where did you learn your techniques? My first foray into jewelry making actually happened when I was in my early20’s, before the film industry was paying my bills. I made items out of plastic and applique, paint and passementerie purchased from odd and wonderful places in Manhattan like Canal Plastics and M+J Trimmings. I sold the items I made to friends on the film sets where I worked. But soon my film producing career took off and there wasn’t time for jewelry-making. I circled back around to jewelry-making after I had my daughter. She was in nursery school and the school was having a fundraiser. Someone was going to make earrings and I joined that team. My desire to make jewelry was re-kindled quickly. Within a week, I had bought and re-finished a roll top desk which became my workbench and took over part of the house for my hobby, which became a business 5 weeks later, after I made 3,000 dollars in a weekend at a local craft show.I learned some hand techniques from a local bead shop. But soon, I wanted to move into more stone-set work. The pieces that I am doing now are the result of my drawings and the understanding I have gained from working with wonderful masters in the fields of gemstones, CAD/CAM, stone setting and finishing. I have also applied my perfectionist tendencies and all of these talented, patient people who work with me know that I am a stickler for detail. Jeanne has described her work as a “marriage of opposites” which I asked her to elaborate on. I enjoy investigating marriages of opposition in my work. 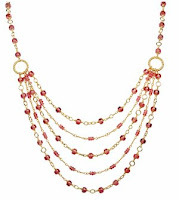 Hard gold becomes supple in the form of a granulated bead chain, as in our Strata Collection. Finishes, both shiny and matte can be combined to pleasing affect, as in our Mandala Collection. Faceted stones can be combined with cabochon, to add another dimension of light and color variation to the effect of our stacked rings. I would describe my style as shimmering elegance in living color. Everywhere. Truly. Most obviously, perhaps, architecture — stained glass windows, carved lintels, the curves of buttressed arches and their relationship to the human form. But, perhaps, not so obvious, the shape of pasta, television sitcoms from the ’60’s, Greek Tragedy, wallpaper, reflections of the sun and clouds on skyscrapers, the rainbow of refracted light from the city (NYC) at night. I have a pattern recognition brain. I’m always cataloguing what I see. You made a decision early on to move to high end stones and metals. When did you know that you were ready to transition to these expensive materials? I transitioned to expensive materials because I wanted to make things with long-lasting resonance. Items that are more valuable are less likely to be”throw-away.” I transitioned early, as soon as I felt I had the skill set. It appears that you have been more successful than most jewelry designers in the marketing of your business—including getting celebrities to wear your designs. We have been successful at getting the jewelry onto some celebrity personalities. I think this is a key to some early acceptance in the marketplace. What do you think is the key to running a successful jewelry business? I think there are many keys and many different kinds of successful businesses. First, you must have work that strikes a chord in the audience. Second, use tried and true methods to reach your intended audience — trade shows, trade publication coverage, consumer publication coverage, consumer advertising, celebrity placement. Third, perseverance. Fourth, willingness to learn from your mistakes. Design what you love. Find an audience. Decide what size business you want and GO FOR IT! What do you have to lose? Jeanne’s work can be found in over 40 stores throughout the country. She’s grown her business to such an extent that she no longer makes the jewelry, but instead oversees a group of skilled artisans who see that her visions come to fruition. 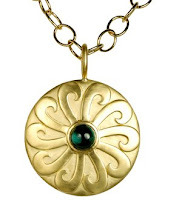 Jeanne Johngren seems to me to have reached the ultimate achievement of developing and marketing her jewelry passion into a viable and successful business. Hat’s off to her! Next post: Ancient Gold Necklace–Oldest Ever Found!